In case you missed it, today we announced the availability of the open source LoopBack API Gateway. The LoopBack API Gateway is open source and is the “minimum viable product” (MVP) that covers key use cases piloted with our co-development partners. In this blog we’ll show you how to get started with a sample application to test out the features of the gateway. 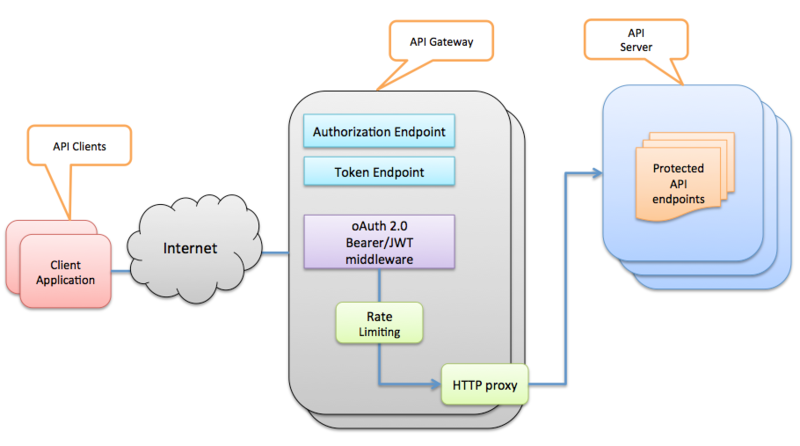 An API gateway is a component within systems architecture to externalize, secure and manage APIs. The API gateway sits as an intermediary between the many consumers of APIs – API clients and the many producers of the APIs on the backend – API servers. The architecture is illustrated in the diagram below. The application is initially scaffolded using slc loopback command. We customize server/server.js to add specific features for the gateway. Create the https server for the application. See https://github.com/strongloop/loopback-example-ssl for more details. The oAuth 2.0 integration is done using loopback-component-oauth2. In our case, we configure the API gateway as both an authorization server and resource server. The oAuth authorization server exposes the authorization endpoint to allow resource owners (users) to grant permissions to authenticated client applications. It also creates the token endpoint to issue access tokens to client applications with valid grants. To protect endpoints with oAuth 2.0, we set up middleware that checks incoming requests for an access token and validate it with the information persisted on the server when the token is issued. Rate limiting controls how many API calls can be made from client applications within a certain period of time. keys: identify who is making the api call. The keys can be the client application id, the user id, the client ip address, or a combination of more than one identities. The sample uses a token bucket based algorithm to enforce the rate limits based on authenticated client application ids. The proxy middleware allows incoming requests to be forwarded/dispatched to other servers. In this tutorial, we’ll route /api/ to http://localhost:3002/api/. The implementation is based on node-http-proxy. oAuth 2.0 requires client applications to be registered. In this tutorial, we can simply create a new instance with the LoopBack built-in application model. The client id is 123 and the client secret is secret. The resource owner is basically a user. 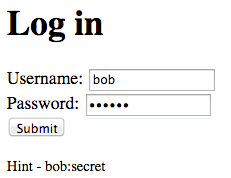 We create a user named bob with password secret for testing. 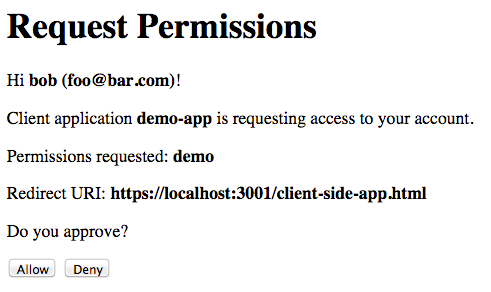 There are a few steps to run the demo application. Let's add some note properties now. Let's add another note property. Open a browser and point to http://localhost:3002/explorer. Locate the ‘POST notes’ section and add a few notes. Open a browser and point to http://localhost:3000. You will see the browser to be redirected to https://localhost:3001. Please note your browser might complain about the SSL certificate as it is self-signed. It’s safe to ignore the warning and proceed. 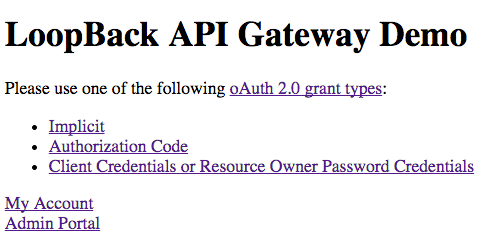 The home page below shows multiple options to try out the oAuth 2.0 grant types. Let’s start with the explicit flow. Now you need to log in as the resource owner. The following dialog requests permission from the resource owner (user) to approve the access by the client application. Click “Allow”. The browser will be redirected to the callback page. The callback page builds the links with the access token. Click on ‘Calling /api/notes’. To test rate limiting, please run the following script which sends 150 requests to the server. The script prints out the rate limit and remaining. We support JSON Web Token (JWT) as client authentication and authorization grant for oAuth 2.0. See https://tools.ietf.org/html/draft-ietf-oauth-jwt-bearer-10 for more details. The first command requests an access token with a JWT token signed by the private key. The second command requests an access token using a JWT token as the assertion type.